Fig. 1: A non temperature controlled diode measurement. 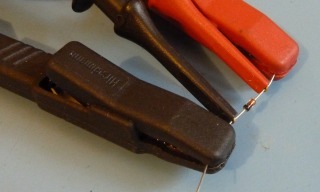 The diode under test is marked as DUT in this article. Fig. 2: Basic circuit diagram to measure a diode characteristic. The voltage-current curve is the best known characteristic of a diode. It tells what the voltage drop will be at a given current. The easiest way to obtain this curve is by using the circuit of figure 2. The measuring current is set by the adjustable voltage source V and resistor R. Or, if available, a adjustable current source an be used. The curve is recorded by increasing the voltage V step by step. At each voltage a the current through the diode DUT is measured with a amperemeter A. The voltage drop across the diode is measured with the voltmeter V.
Fig. 3: The measuring current will increase the junction temperature which cause a distorted diode characteristic. By doing such a manual measurement a constant current is flowing through the diode. The product of the diode current ID and diode voltage VD is the dissipated power that will warm-up the diode. At the start where the current is still low, the self-heating is minor. As the current is further increased the dissipated power is growing and the junction temperature is increased along. This behavior is displayed as the blue trace in figure 3. For comparison, the diode characteristic whereof the junction temperature is held constant at 47 º, is shown as a red trace in the graph. By this increase in temperature during the measurement an unreliable representation of the diode characteristic is acquired. Due to this measurement error it looks like the curve has a very sharp bend and rises very steeply. The true characteristic at a constant junction temperature is smoother and less steep. This example shows the importance of knowing the accurate junction temperature to get a reliable result. How the forward characteristic is measured correctly will be described further on. The above explained that it is necessary to know the junction temperature to do a proper measurement on diodes. So, this temperature as to be determined first. Fig. 4: Circuit to measure the junction temperature. The junction temperature is the temperature of the PN depletion region in the silicon. This temperature can't be measured with a thermometer because it's located within the diode casing and is very small. However, this temperature can be determined indirectly. The forward voltage of any diode is highly dependent on the temperature. By applying a small current through the diode and measuring the forward voltage, the temperature of the junction can be measured. To do this, the DUT must first be calibrated. The circuit in figure 4 is used for measuring the junction temperature. The current flowing through the diode is 415 µA and is determined by the voltage 20 V minus the diode forward voltage and the resistor Rt. The current is slightly dependent on the variation in voltage drop of the diode. An option is to increase both the voltage and resistor values for a better accuracy. The influence of the voltmeter (or oscilloscope) is negligible. The internal resistance of the voltmeter causes an current of approximately 50 nA. The self-heating by the measure current must be kept low as possible. At a forward voltage of 0.5 V and a current of 415 µA the diode dissipates only 208 µW. Even a small signal diode with a thermal resistance RΘj-a of 300 K/W will see a junction temperature rise of only 0.06 °C. Fig. 5: Measuring arrangement for temperature controlled measurements. The forward voltage must be measured over a large as possible temperature range. The diode is therefore exposed to a number of temperatures. After a period of stabilization the case temperature and forward voltage is measured. By this exposure to an external temperature the junction will reach the same temperature as the case. An internal heating of the diode by a large current in not allowed. The heat will than flow in the opposite direction from the the junction to the case what will cause temperature differences. Consider distorting heat flows through the wires. The temperature must be measured on the part of the casing where the thermal contact between the junction and casing is the best. Cylinder shaped casings with axial wires could be placed fully in a narrow fitted hole in an aluminum block, so that the diode is fully exposed to an uniform temperature. Figure 5 shows a measurement arrangement with a diode in a TO220 casing. 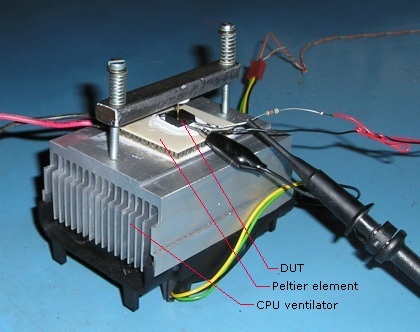 The diode is clamped onto an peltier element whereof the heat on the other site is removed with a CPU-fan. By varying the peltier voltage and polarity the temperature of the diode can be controlled from -20 °C to +100 °C. Fig. 6: Forward voltage vs. temperature BYV29-500. The parameters α and T0 will be used in the following chapters to determine the junction temperature. One of the most important properties of a diode is the forward characteristic. It seems easy to achieve this characteristic by varying the diode current and note the associated voltage. But, as explained in the beginning, the self heating of the diode causes a faulty characteristic. By applying an impulse shaped current instead of a continuous current, the dissipation in the diode can significantly being reduced. A second benefit is that larger measure currents can be applied without the risk of overheating. The curve in figure 3 showed already that at currents below 6 ampere the junction temperature was risen to 90 °C. The average current of a BYV29 is specified at 9 A and the maximum at 100 A. It would be impossible to measure at these currents if a continuous current was used. In this example is an impulse width of 70 µs whereat the measure current is flowing. The repetition rate is 1 Hz. The impulse width must be suited to the recovery time of the diode. Fig. 7: Measuring arrangement to record the diode characteristic with impulse currents. The measuring circuit is shown in figure 7 with which diodes are measured with impulse shaped currents. The MOSFET T1 is used as power switch and is driven by an impulse generator. The impulse generator must have a floating output so it can be connected directly to the gate and source of the MOSFET. The source voltage switches now between 0 V and Vvar. The resistor R1 draws the source voltage quickly to 0 V if the MOSFET is switched off. The resistor R2 limits the diode current. The value of this resistor has to be chosen so that at the maximum voltage of Vvar the maximum measure current is reached. A ten times higher value for the resistor R1 will do. Now the diode current can be set by the adjustable voltage Vvar. Be aware that the maximum value Vvar the isolation voltage of the impulse generator never exceeds. When the MOSFET is switched off, Rt provides the diode DUT with the test current to measure the junction temperature. Diode D1 prevents that the the temperature measurements isn't disrupted. Without this diode a portion the temperature measure current shall flow through the resistors R1 and R2. However the reverse voltage across the diode D1 is small during the temperature measurement, a type with a small leakage current has to be chosen. And off course the diode must withstand the impulse current. The impulse current is supplied by the reservoir capacitor C1. Notwithstanding the high impulse currents the power supply is low due to the low duty-cycle. In the example is measured with 20 A currents while the average current was only 1.4 mA. A small power supply will fulfill the job. The voltage across the diode and the current through is measured with an oscilloscope. In this example the current s measured with the use of a DC-current probe. If such a probe is not available than a shunt resistor can be used at the same location. In this case the the scope channel CH1 measures the sum of the voltage across the diode and the shunt resistor. Therefore the voltage at CH2 must be subtracted from the CH1 voltage to obtain the diode voltage. Below a screenshot is shown of one of the many measurements needed to record the diode forward characteristic. Fig. 8: Impulse voltage and current during the diode measurement. Fig. 9: Measured data diode characteristic at 45 °C. A short moment before the positive going edge of the impulse and at a stable section of the impulse itself the voltages and currents are measured. These places are marked with the cursors. The voltage for junction temperature is measured just before the positive edge. The value is here 304.9 mV that corresponds with a junction temperature of 45 °C. The values during the impulse must be measured as close as possible to the positive edge where the voltage and current values are stabilized. The junction will warm-up during the measurement due to the thermal impedance. The measured diode forward voltage is 1.0767 V at a current of 9.951 A. If the measuring current is increased with 1-2-5 steps than a large current range is covered with a minimum number of measurements. Figure 9 shows the measured values at 45 ºC. During this measurement the junction temperature must be kept constant as possible. The same measurement protocol is used to measure the forward curve at different temperatures to make the temperature dependency visible. The obtained diode characteristics can be plotted in the same graph. A plot onto a lin-lin scale graph is displayed in figure 10. A plot onto a lin-log scale as in figure 11 shows more details withing the full current range. This kind op plots can often be seen in datasheets. Fig. 10: Forward characteristic on a linear scale. Fig. 11: Forward characteristic on a log-log scale. When applying a negative voltage on a diode only a small leakage current shall flow. Whenever the reverse voltage is increased and reached a certain value the reverse current will increase suddenly. This is the breakdown voltage and can destroy the diode if the current isn't limited. The breakdown voltage can safely be measured if the amount of energy and therefore the current is limited. The measuring circuit for this measurement is displayed in figure 12. Figure 14 shows the most important voltages and currents. Fig. 13: Arrangement to determine the temperature. Fig. 12: Circuit to measure the breakdown voltage. TON is the time in which the MOSFET conducts. Fig. 14: Voltages and current in the measuring arrangement. The parasitic capacity is equal to the parallel circuit of the MOSFET's output capacity Coss, the junction capacity of the diode DUT and the probe capacity. In the example test circuit only Coss (= 82 pF) and the probe capacity (= 8 pF) are known. So the total capacity Cpar is 90 pF. The used inductor has a value of 1.5 mH and a saturation current of 1.8 A. If the supply voltage VVAR is set at 10 V and TON is 20 µs, than the maximum current according to equation 4 will be 133 mA. This current should be spacious below the saturation current of the inductor. The maximum voltage according to equation 5 will be 544 V. This voltage is very close to the the expected breakdown voltage. By varying the supply voltage and/or impulse time the peak voltage can be set. To limit the dissipation in the junction the repetition rate should be kept low, for example 10 Hz. The voltages generated by this circuit could be very high. Always check if the oscilloscope and probes can handle this voltages. The example uses a BUZ80 as switch, and according to the specifications it is suitable for voltages up to 800 For even higher peak voltages it's better to look for bipolar transistors because there is a wider choice in the high voltage range and they are cheaper. Start the test carefully with a minimum TON setting and increase the voltage VVAR slowly from 0 V and monitor the peak voltage with a oscilloscope. The used MOSET switch has a breakdown voltage itself. To avoid that this breakdown voltage is confused with the diode breakdown voltage, first the MOSFET breakdown voltage must be measured without the diode DUT. Withe the used BUZ80 a breakdown voltage of 960 V is measured. Figure 15 shows a screen shot of the measurement. The green trace (TR. A) is the voltage across the diode, the blue trace (TR. B) is the current through the inductor. The measurement of the inductor current has only a educational purpose and it is not necessarily to measure it. The gray trace (CH. C) shows the peak voltage shape when the breakdown voltage isn't reached yet. The flattening of the peak is clearly noticeable when the breakdown voltage is reached. The supply voltage VVAR in this case is 10 V, and TON is 56 µs. Fig. 15: Measured breakdown voltage of a BYV29-500 at room temperature. Fig. 17: Breakdown voltage vs junction temperature. Fig. 16: Measured breakdown voltages. There is a moderate temperature dependency of the breakdown voltage. If the measurements are done at different junction temperatures this temperature dependency can be made visible. Bring the diode at the desired temperature and check the junction temperature with the circuit in figure 13. While doing the breakdown voltage measurement, the temperature measuring circuit must be fully disconnected, and for the temperature measurement the high voltage circuit must be disconnected. The measuring results are shown as a table in figure 16 and as graph in figure 17. The tested BYV29-500 has a specified "maximum reverse voltage" of 500 V. The measured breakdown voltage of this specimen is much higher. The reverse current of a diode lays in the order of magnitude between a few nanoamperes to milliamperes. The reverse current is temperature as well as reverse voltage dependent. While measuring these small currents one must be aware of external leakage currents by contaminants. Measurements at low temperatures must be carried out quickly so that condensation and ripe don't get the opportunity to influence the measurement. Fig. 18: Arrangement to measure the reverse current. The measuring arrangement to measure the reverse current is divided into two segments. The circuit on the left is used to measure the junction temperature, and the circuit on the right is used to measure the reverse characteristics. These two circuits may never be combined or connected, otherwise they influence each other. The reverse current is measured by measuring the voltage across a high ohmic resistor Rs. The resistor value must suit the current to measure so that the the voltage across can be measured with the 200 mV or 2 V range. When the current is very small, the internal resistant of the multimeter is already adequately so the shunt resistor Rs may void. Fig. 19: Measured reverse current values at 45 °C. The measurement procedure consists of two parts: First the diode DUT is brought to the right temperature. If the right temperature is set and it is stable, the the temperature measure circuit is disconnected and measurement can begin. Connect the reverse current circuit to the diode. Start with the lowest voltage for Vvar and note the voltage across the shunt resistor VRs. Repeat this measurement with increasing voltages for Vvar till the full voltage range is measured. On the right is the measurement data shown taken at a junction temperature of +45 °C. Fig. 20: The reverse current as function of the reverse voltage and temperature. The above described measurement can be carried out at different temperatures to get a good impression of the temperature dependency of the reverse current. All the data is than plotted in a log-log graph as shown in figure 20. The measure points are marked in this graph. The diode measured in this example can withstand a reverse voltage of 500 V. The measurement is done unto a voltage of only 60 V. The reason for this that the available voltage supply couldn't go higher. If the tested diode is used at higher voltages than the measurement voltage range must be extended.